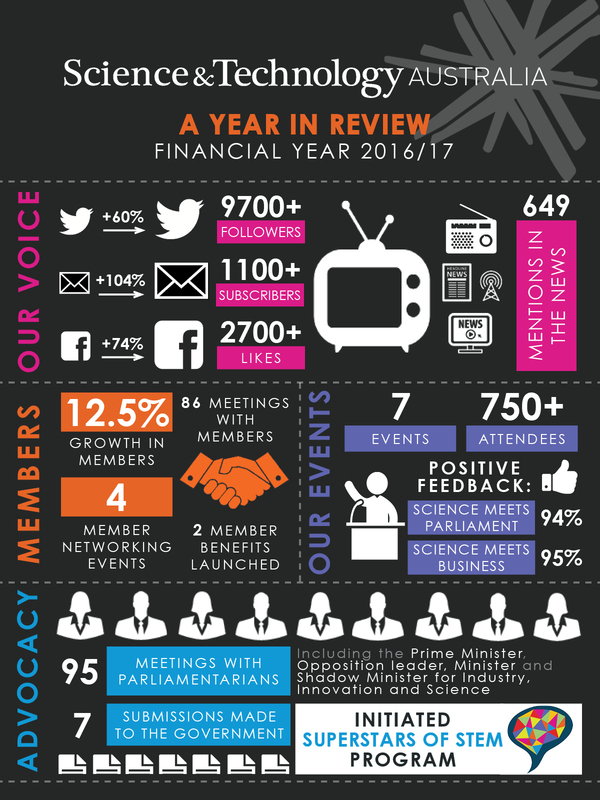 Last financial year, Science & Technology Australia successfully amplified the voices of our members, advocated for science and technology on the federal stage, reached a record number of Australians through our numerous communications channels, and increased our capacity to represent Australia’s STEM sector, with membership growth of 12.5%. We also created our new Superstars of STEM program, held seven successful events aimed at engaging the public with science and enhancing scientists’ and technologists’ skills and networks (including Science meets Parliament, public forums and Science meets Business), and managed 95 meetings with Parliamentarians in total (that’s almost two a week). In 2017/2018 we plan to build on these successes, and look forward to doing even more on behalf of our members to strengthen the science, technology, engineering and mathematics sectors, and to supporting Australia as a global leader in STEM. To read more about this, have a look at our latest Strategic Plan.